I am not a huge fan of cinnamon. However, I love the aroma of cinnamon. Imagine if you will, the smells of cinnamon, butter and vanilla, all together. It is quite a delicious aroma. 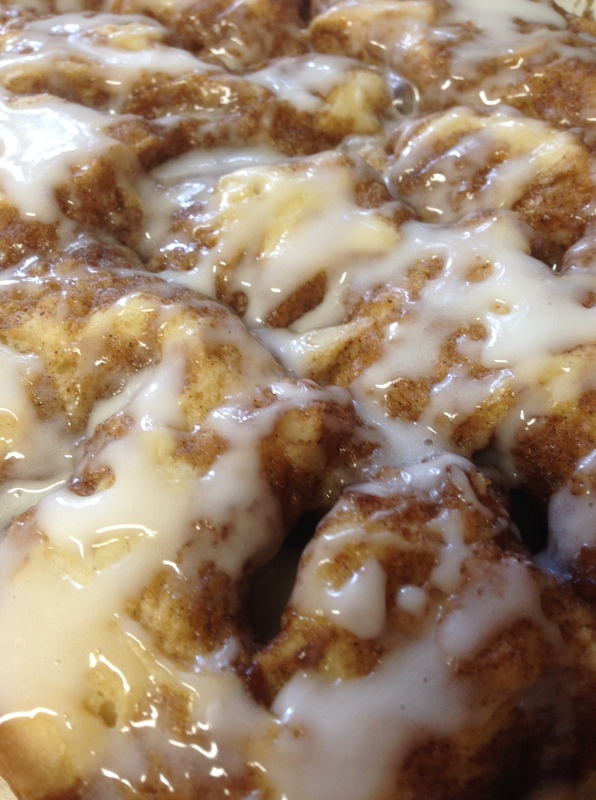 That aroma will be drifting through your home, when you bake this. Actually, I would like a bubble bath in this scent. Ahhhhhhhhh, that would be heavenly. I must warn you….as delicious as this cake is, it is definitely not something you want to make frequently. It is loaded with butter, and sugar, and butter and more butter. So please proceed with caution!! LOL If you like cinnamon rolls, you will love this cake. Preheat oven to 350. Mix flour, salt, sugar, baking powder, milk, eggs and vanilla together. Add the 1 stick of melted butter. Pour batter into a buttered 9×13 baking dish. 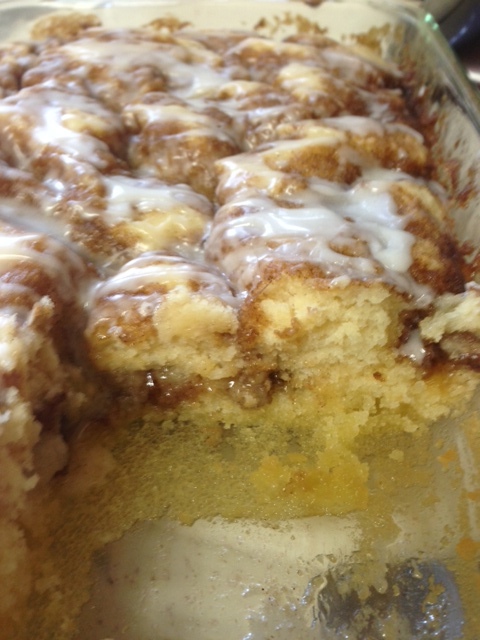 For the topping, mix the 2 sticks of butter, brown sugar, 2 tablespoons of flour and cinnamon. Drop by spoonfuls over the cake batter. 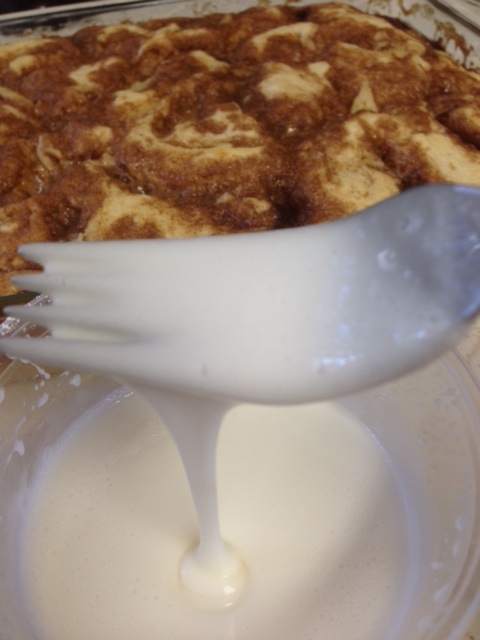 Use a knife to swirl through batter. Bake at 350 for about 25-30 minutes or until toothpick comes out clean. Mix the glaze ingredients together and drizzle over the warm cake. YOU MAY WANT TO USE THE GLAZE SPARINGLY, since this is a very sweet cake. I love Fridays. The one day of the week when spending the day in the office is almost tolerable…..kinda sorta. LOL. 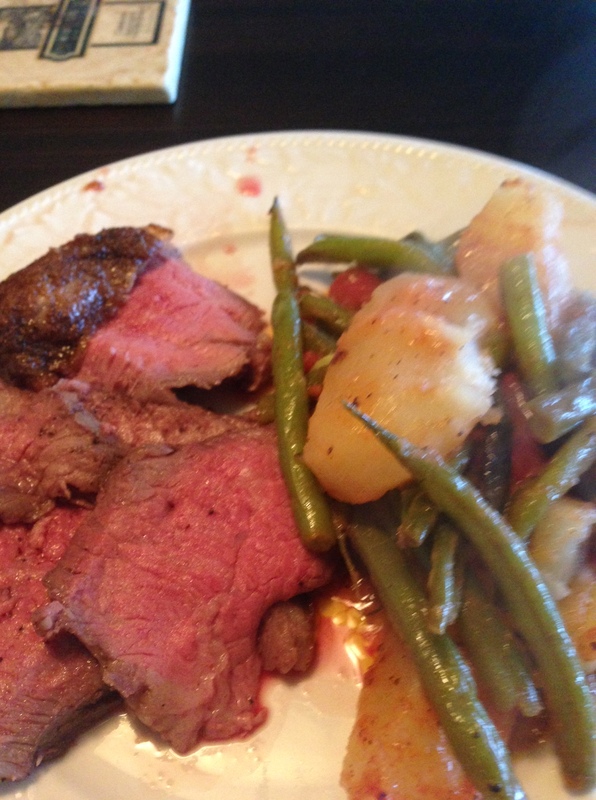 And after a long day in the office, I am looking forward to a prime rib dinner, a glass of wine…..good company. I can’t wait till the day is over. I usually take some treats for the servers at the restaurant where I am going. It’s fun to see their faces light up when they see me bringing in treats. I love that feeling. I just love feeding people……it makes them happy, which makes me happy. 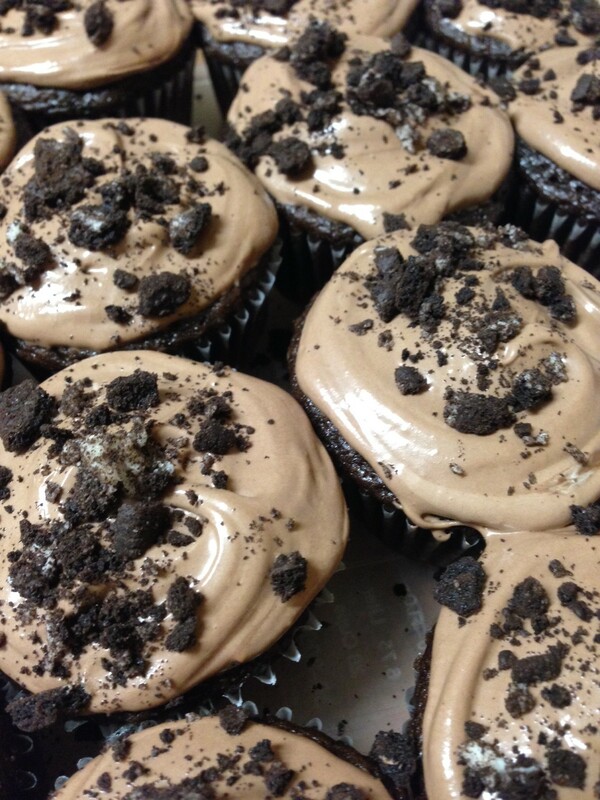 I think their faces will definitely light up today when I walk in with Triple Chocolate cookie crumb cupcakes! I brought some in to work today for Cupcake Friday. I like seeing these happy faces in the office, too. It’s fun walking around watching coworkers bite into a messy cupcake, or seeing the empty wrapper sitting on a little plate with a few little crumbs left as evidence that there was once something yummy there on the plate. Ah yes, it makes my heart happy. Today’s cupcake has a light fluffy cake texture. The frosting is creamy and sweet. 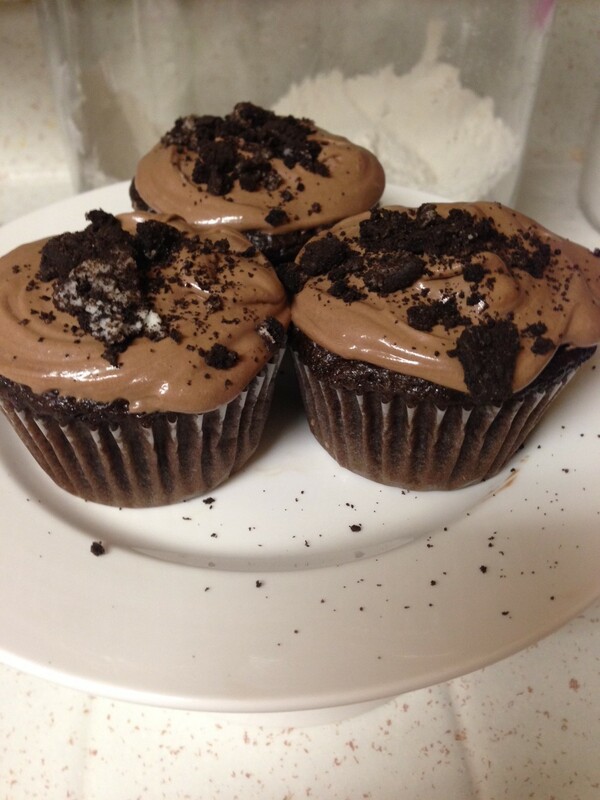 It’s all sprinkled with Oreo cookies that I chopped up. Definately not for the faint of heart when it comes to sugar! Have a cold glass of milk handy. Enjoy! Preheat oven to 350°. Line standard muffin pan with paper liners. Sift cocoa powder, flour, sugar, baking soda, baking powder, and salt into a large bowl. Add eggs, warm water, sour cream, oil, and vanilla, and mix until smooth by hand whisk or mixer. 1 container of marshmallow fluff (optional) Cupcakes pictured. do have the marshmallow fluff. In mixer, beat butter, cocoa, powdered sugar till creamy. add marshmallow fluff. If your frosting is stiff, just add a few drops of milk. Butterless chocolate chip cookie?? Really? Don’t you just love a good chocolate chip cookie? I know I do!!!! Every time I come across a new recipe, I just have to try it. This one caught my attention because it calls for shortening instead of butter. It’s hard to imagine a CCC without a buttery chew…..that little bit of buttery shine on your fingers when eating a CCC with butter. M-m-m-m-m. Butter is good….oh so good. 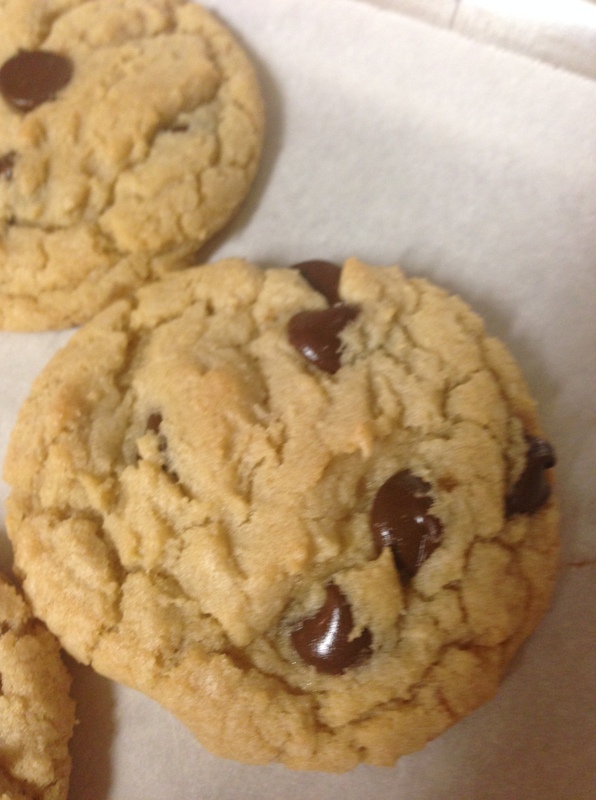 However, this is a good cookie….even without the butter….without that little bit of butter stain on the baking sheet….without the butter shine on your fingers. I like this cookie. I tried substituting a bit of the shortening with some butter…so that it had both. But I was very disappointed. puffy little dry cookies are NOT good. For this recipe, I would stick with the shortening. Notice the nice crackly texture…I love seeing that. The way a cookie looks, is very important to me. So I give this cookie a 9 for appearance. If you are not a huge fan of butter, I highly recommend this cookie. It has a good crisp texture, but yet chewy too. Beat shortening, brown sugar and white sugar together until creamy. Add eggs and vanilla and mix well. Add the flour, salt and soda. Mix well. 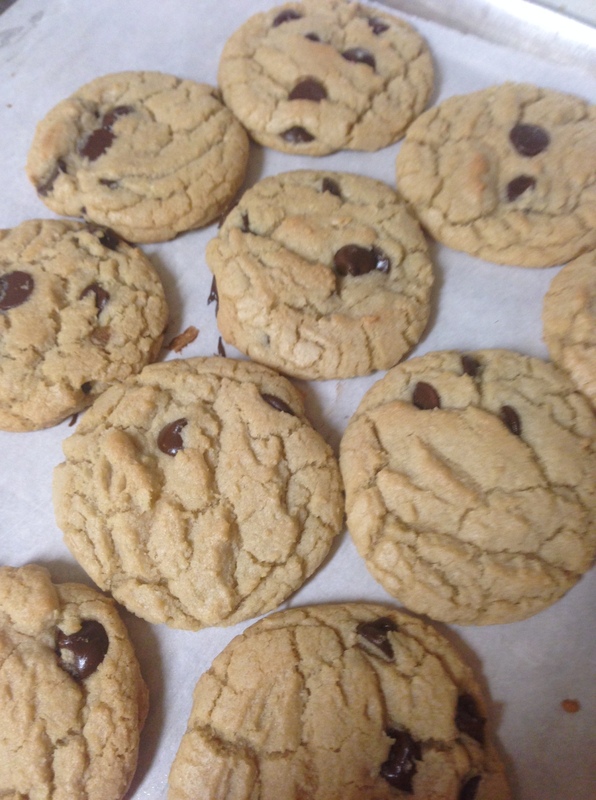 Drop by spoonful (about a generous tablespoon) on a cookie sheet lined with parchment paper. Bake at 350 degrees for about 10-12 minutes or until golden brown. I love my beef. I won’t apologize for it. I know some of you reading this are repulsed, but so be it. You can eat your veggie dinners….that’s fine. But I really need my beef. I recently asked a vegetarian friend of mine if she likes chicken. Her answer was NO. I asked her if she likes fish….the response that I got from her was totally unexpected. Hahahahah, not sure if I could even repeat it. Oh, I so want to tell you, but I wouldn’t want to offend anyone. She could have just simply replied with a “NO”. I mean Iwould have been fine with that. But oh no…..she definitely caught me off guard with her reply. But I must admit, her response did give me a good laugh indeed. OMG. I am still laughing. So, I suppose when she comes over for dinner, I will feed her a veggie-tofu-boring burger or something, minus the you-know-what. I won’t tell you who she is….I know she is reading this….but her name starts with a P and ends with a AULA….LOL. Anyway, enough about the beef. The star of the show in this dinner, is not the wonderful, juicy, slices of tender tri-tip. 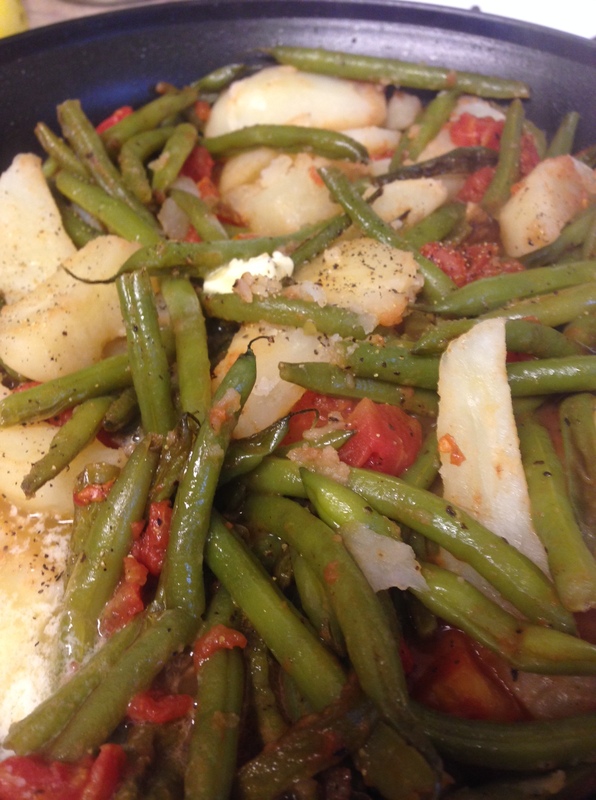 It is the green bean tomato potato dish. It is so yummy, colorful and yummy. The potatoes absorb some of the tomato juices and it is delicious. Plus, it’s very yummy. Oh so yummy. 🙂 It is easy to make too. You can also make this in the crockpot. cut washed green beans in half and saute with the garlic, in a wee bit of olive oil. Add about a 1 1/2 cups of water and cover the pan. Let it cook for about 15 minutes. Add the diced tomatoes, salt and pepper and the potatoes. simmer till the beans are tender. Devour!!! Dump it all in the pot. Who doesn’t love brownies? 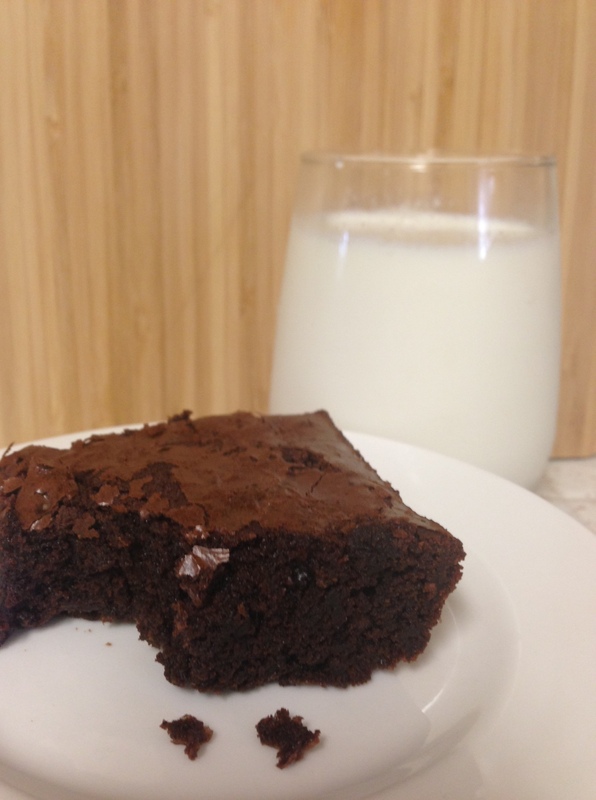 Brownies are my favorite dessert…..I think. Especially when they are topped with a scoop of vanilla ice cream! 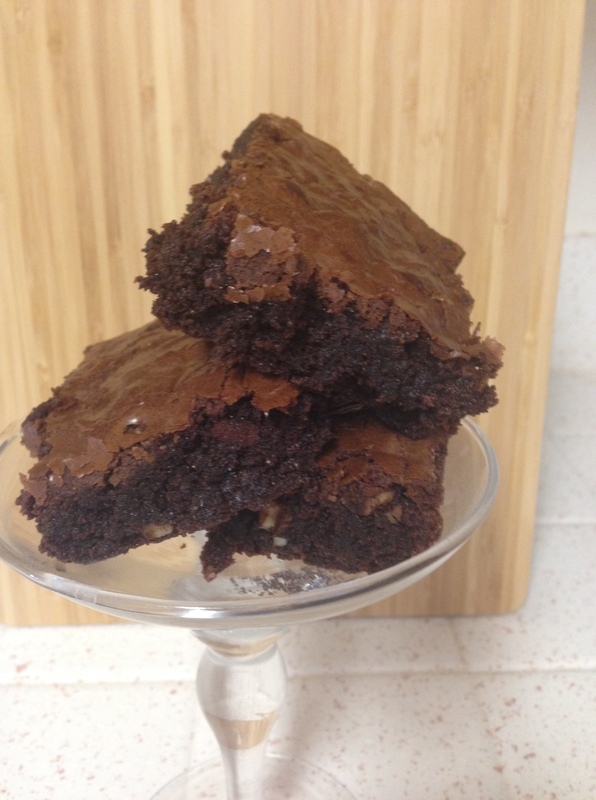 Many years ago, I had a brownie recipe that was amazing. I had tried so many recipes and finally came up with the perfect brownie. OH, yes I did! I took some samples down to the deli that was located in our office building. I had the idea that maybe the employees would want to buy my brownies. Wellllll, it just so happened that a distributor for Southland Corporation was making a delivery that day. He sampled the brownies and called me. He asked for some more samples and few days later, asked if I could give him 72 dozen of my brownies!!!! They wanted to carry my brownies in San Diego County 7-11 stores!!!! I was stunned. I was working a full time job and wondered just HOW I was going to do this. That was the first problem. The second problem was that I would be required to find commercial kitchen space. I could not bake in a home kitchen. I frantically started looking for commercial kitchen space. I couldn’t find any place that would rent out their kitchen . I was so disappointed and I regretfully told the Food Distributor my disappointing news. He too was disappointed and I lost my opportunity. I have never forgotten that. It was a huge opportunity!!! 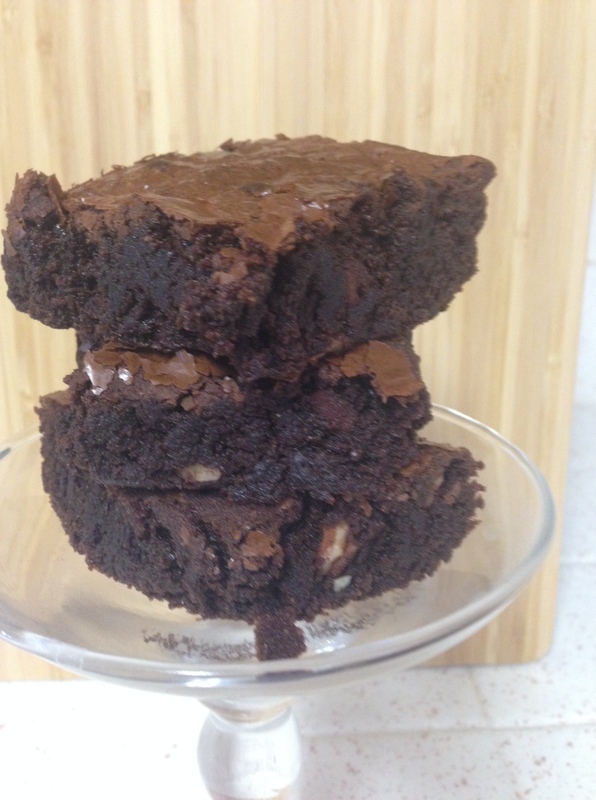 Well, I lost that brownie recipe several years ago….I have not been able to duplicate it, to this day. But now I am on a quest…..to once again make the best brownie. 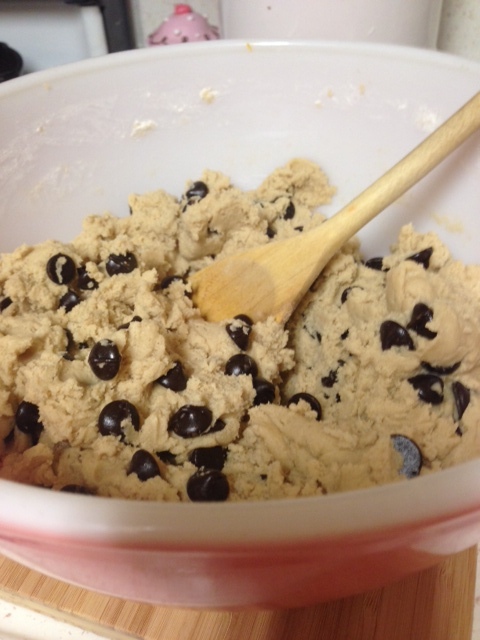 This one pictured here, is good…..but no where near my old, lost recipe. So I must start over…my search is on…I have lots of experimenting to do! This should make my friends very happy to be my little guinea pigs. 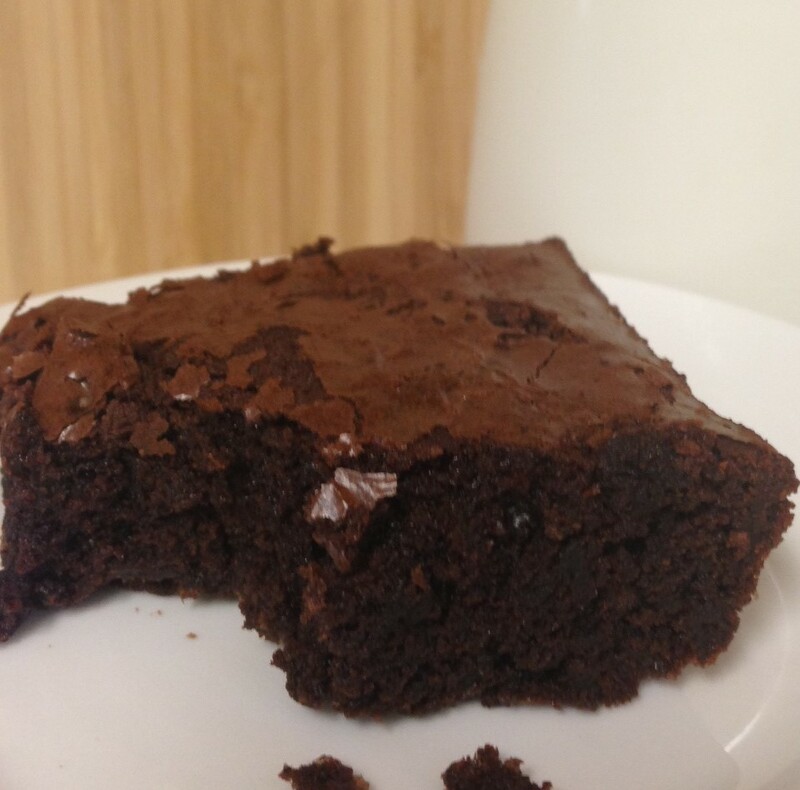 So I will most likely be posting lots of brownie pics…good and bad. 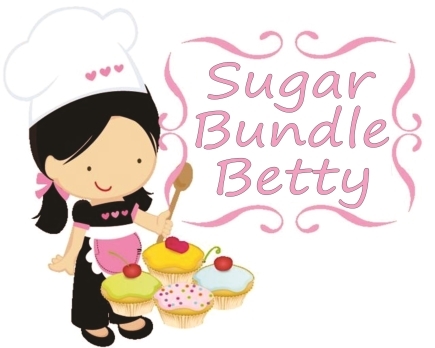 So bake on Sugarbundle……BAKE ON!!!! Spray a 13×9 baking pan with cooking spray and pre-heat oven to 350 degrees. In a sauce pan, melt butter and sugar together until well mixed and smooth. Remove from heat. Let cool. Add eggs and vanilla and mix with a wire whisk until its very smooth. Mix together the remainder of your ingredients and stir into the butter sugar mixture. pour ingredients into your prepared baking pan and bake for about thirty minutes or until a toothpick inserted into the center of the pan comes out with just a few little crumbs. Don’t over bake. 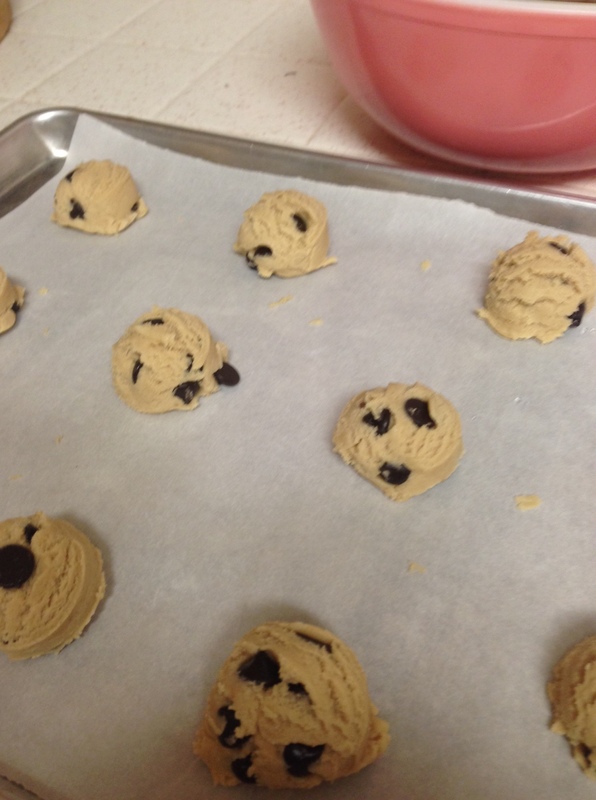 Allow to cool completely…..1 1/2 hours, before cutting.